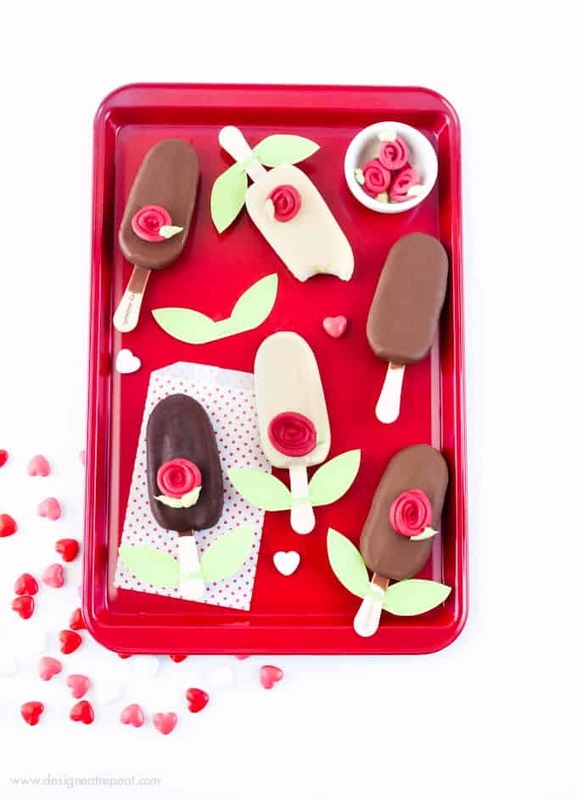 Turn Ice Cream Bars into Easy Valentine's Day Treats! 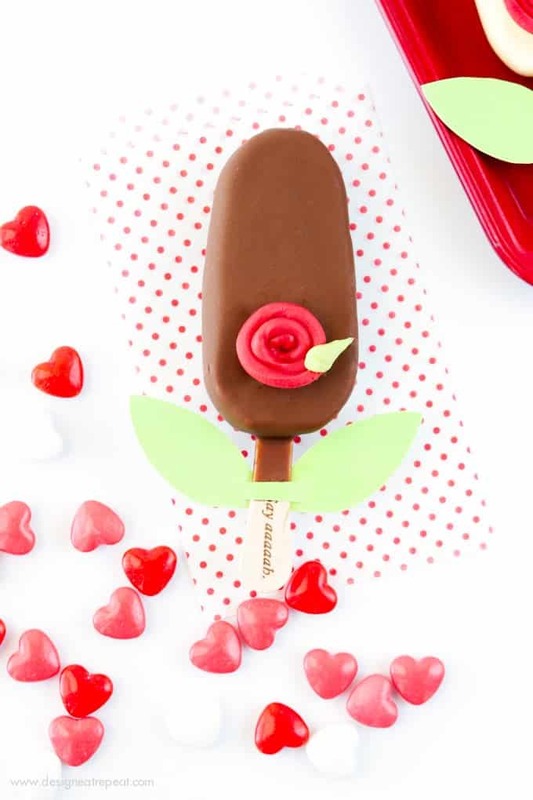 Turn Ice Cream Bars into Easy Valentine’s Day Treats! 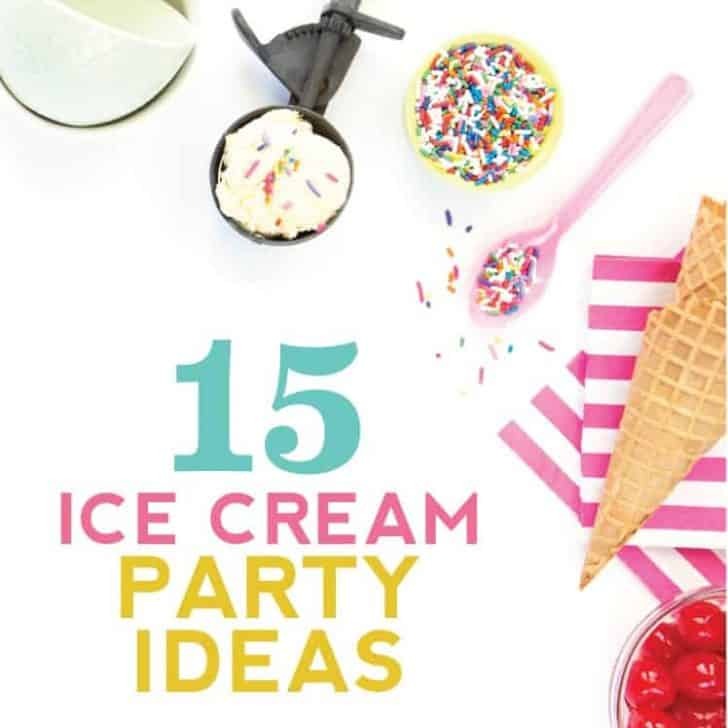 When I first started this blog a few years back, I had all these ideas to do elaborate treats. 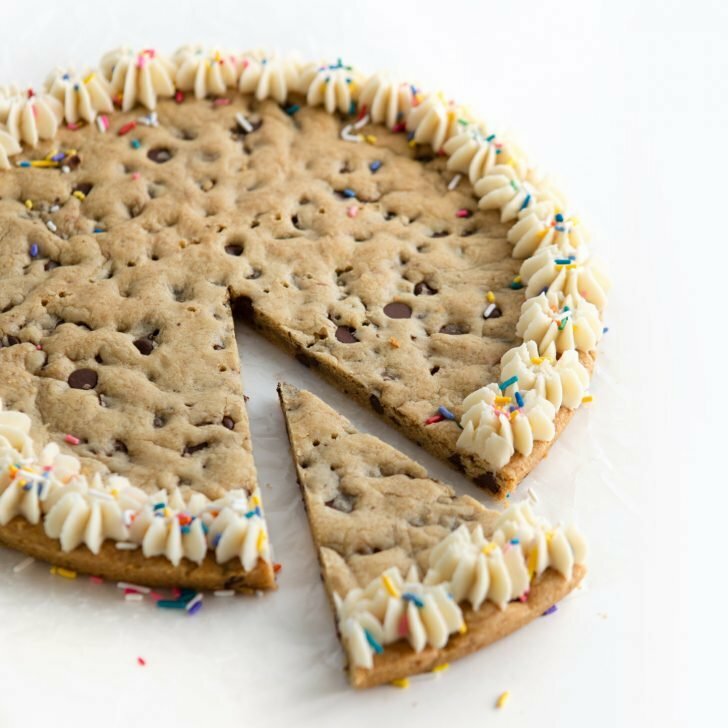 But then I realized that elaborate treats take close to a million hours to make, so throughout the years simple & easy has been the name of the game. 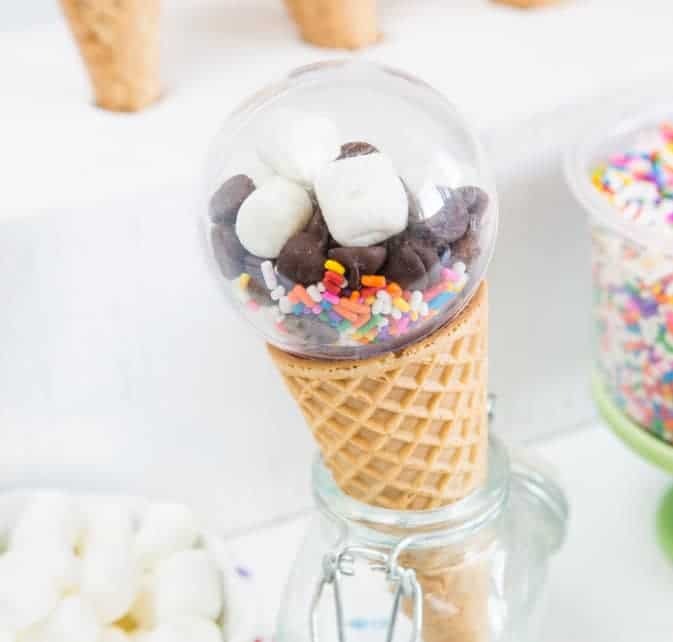 Sure, the idea of homemade ice cream bars from scratch sounds great in theory, but ain’t nobody got time for that these days. 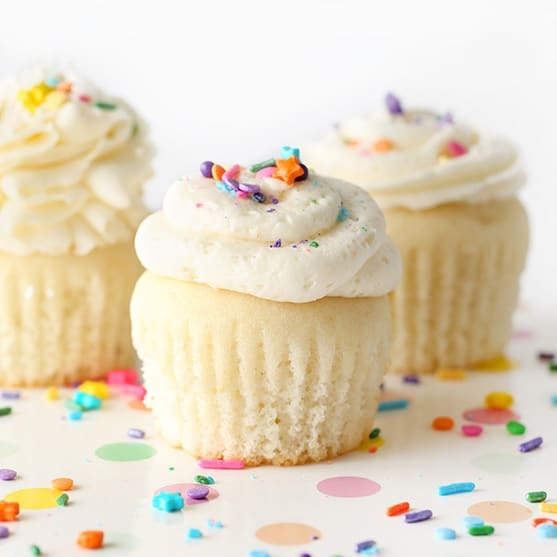 So this year, I’m opting to create simple, semi-homemade ideas that require little prep, still have a homemade touch, and are as tasty as they are cute. And first up? 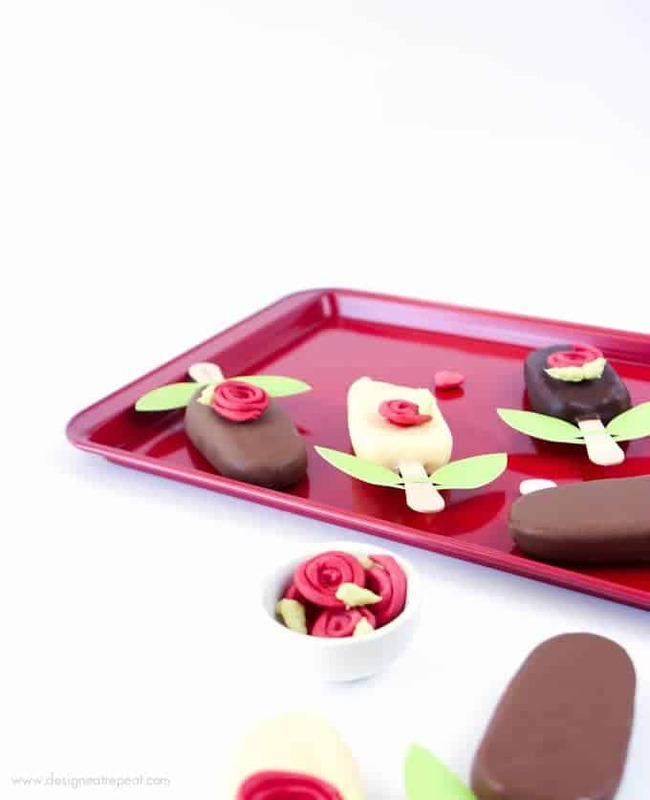 A easy way to turn store-bought ice cream bars into roses! 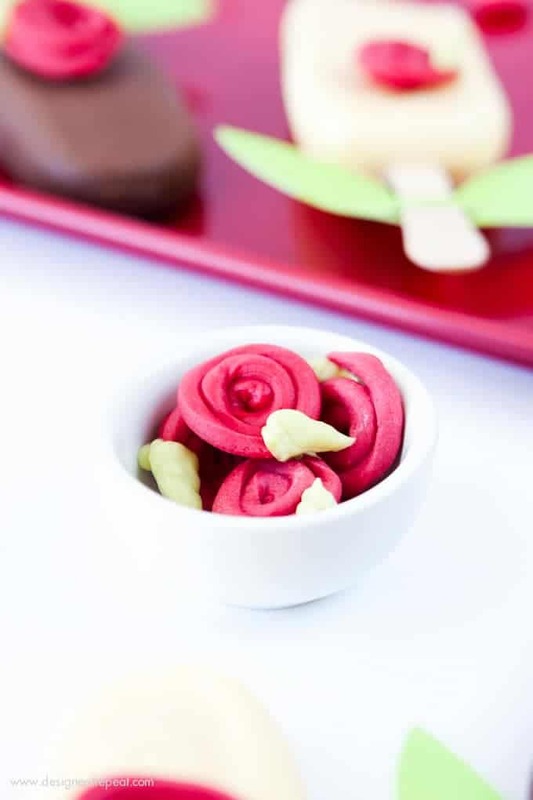 A fun Valentine’s Day treat idea that is fun for both kids and chocolate lovin’ adults! Like I mentioned in Monday’s post, I had some leftover almond bark from the holidays that was needing to be used up. So after a few drops of food coloring, that boring white bark turned into the base for the candy roses! To start, I melted 2 squares of almond bark in a glass bowl on half-power in the microwave until melted. 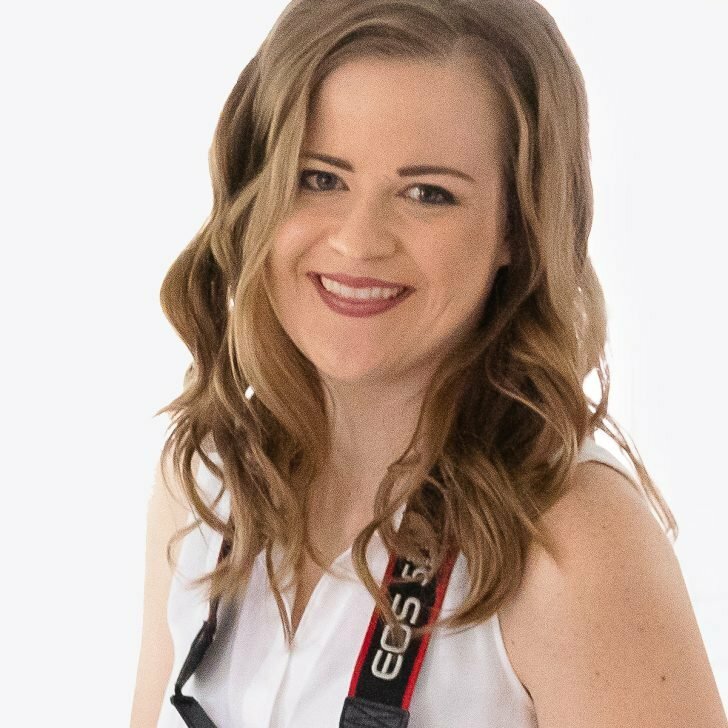 These next steps are where the kids can start helping! Once hardened, I then unwrapped the ice cream bars and set them on a metal cookie sheet in the freezer to stay cool. The next step is to reheat one of the “empty” bowls of almond bark in the microwave for about 30 seconds to soften the excess almond bark on the sides of the bowl. This will be your glue to attach the roses to the icecream bars. 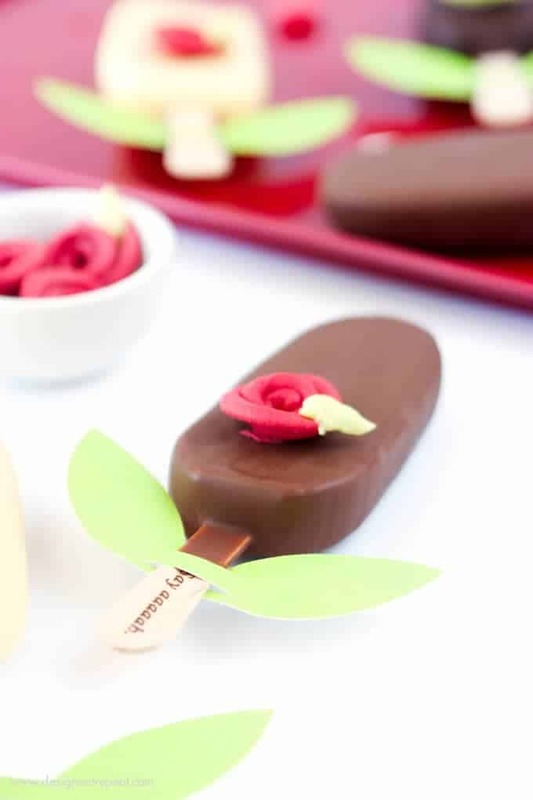 Once softened (it will most likely be pasty & not smooth like before), I dabbed a little bit to the back of each rose and then gently pressed them onto the ice cream bars. As soon as you have them added, put them right back into the freezer to stay cold while you are cutting out the leaves. While freezing, cut-out the green leaves with green construction paper. 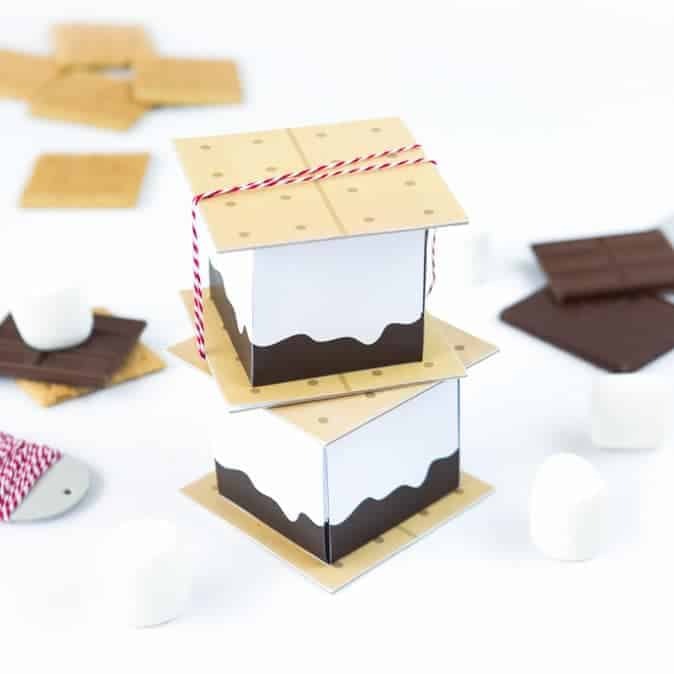 To insert the popsicle stick, cut two slits with an exacto knife (this step is not kid friendly!) that are wide enough to slide on the stick. (The premade template in my shop has pre-determined lines for the Tillamook bars.) 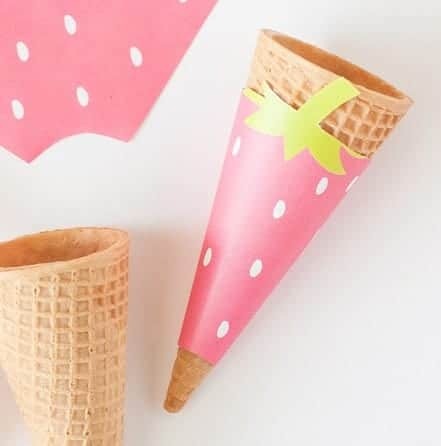 Once cut out, slide each paper leaf on the bottom of the ice cream bar and continue freezing until ready to serve. If you’re looking to make them even easier, you could buy some kind of premade candy rose instead of making your own. But melting almond bark in the microwave only takes a few minutes, and you’ll be able to brush up on your piping skills in the meantime! Like I mentioned above, I just use a small plastic ziploc bag for piping, so clean up is a breeze since you can just toss the bag in the trash when done. For the ice cream bars, I used an assortment of Tillamook bars because I liked the variety of dark & light colors (the white one is lemon! ), but you can use any bars you may have in the freezer. The ones you see above are a variety Salted Caramel (my fave), Mooocha Latte (YUM & I don’t even like coffee flavored things), Old-Fashioned Vanilla, and Lemonilla. All to die for, so any friends in the area can feel free to stop on over for the extras before they ruin any attempt at clean eating. So what do you think? 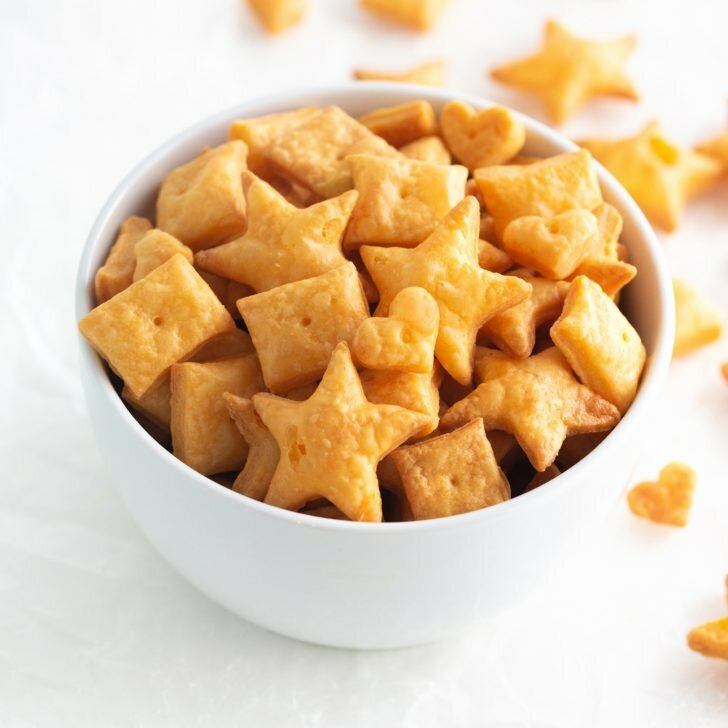 Easy enough to make for this year’s Valentine’s Day treats? I’ll be traveling parts of February, so I probably won’t get around to making the traditional chocolate cake or cheesecakes, but ice cream bars? Those are things I can stand behind. This is so awesome! 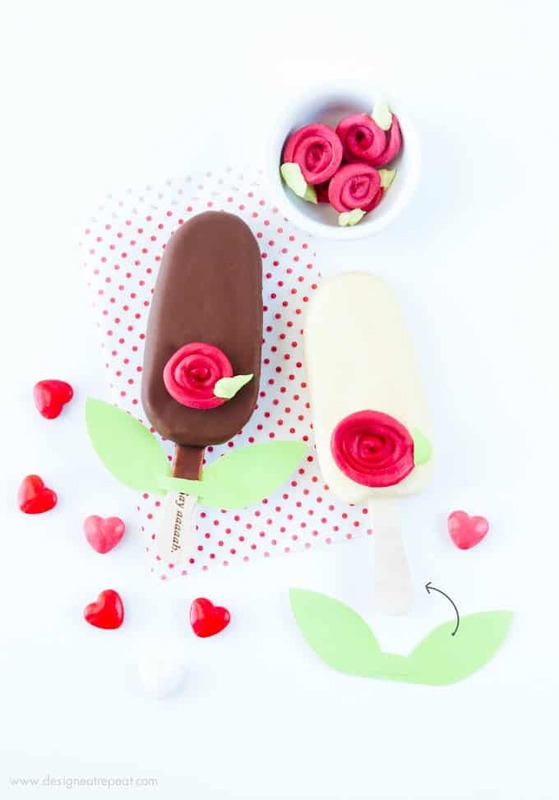 So cute and perfect for Valentines dessert!